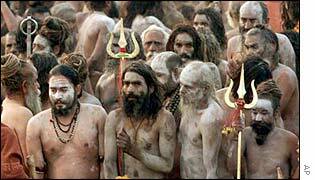 The Indian state of Rajasthan is to introduce a ban on Hindus carrying a traditional religious icon, the trident. The state government says the move is intended to protect Muslims and other religious minorities. But hardline Hindu pressure groups have reacted with fury and vowed to oppose the move. There has been increasing tension between Rajasthan's Hindu and Muslim communities in recent months. In neighbouring Gujarat, more than 1,000 people died last year in violence between Hindus and Muslims. Hindu activists say they have distributed more than 70,000 tridents (trishuls) in Rajasthan in recent months. One Hindu activist, Mahavir Prasad, said all able-bodied Hindus would be given self-defence training as the state government could not guarantee their safety. However, Rajasthan's Home Minister, Gulab Singh Shaktawat, told the BBC the trident could endanger the lives of peace-loving citizens. He singled out two hardline Hindu organisations, the Vishwa Hindu Parishad (VHP) and the Bajrang Dal, which, he said, were spreading hatred against religious minorities. He told the BBC he expected the trident ban to be introduced this week. Other states in India are considering a similar move. The Rajasthan Government says there has been an increase in violence between Hindus and Muslims there in recent years. There have also been reports of the demolition and desecration of religious statues. One of the VHP's senior leaders, Pravin Togadia, says Rajasthan is the next state in India it intends to "saffronise" - a reference to its efforts to impose Hindu nationalism throughout the country. The VHP says the Rajasthan Government's move is part of its efforts to win votes ahead of state elections in November.